Eagle Chapter Regent Barbara Grant and the members of Eagle Chapter welcome you! We are located in Eagle, Idaho, and are one of eleven chapters in the state. Our mission is to promote patriotism, education, and historic preservation, and to serve our country by preserving the memory and spirit of men and women who fought or gave service in the cause of freedom and independence during the American Revolutionary War. We are a chapter for working women, busy moms, and active retirees. Our meetings are held on the second Thursday of each month (September - May). Our social time begins at 6:00 p.m. with the meeting following at 6:30 p.m. For more information, please contact us. Our National Society sponsors a varied array scholarships for students seeking higher education. 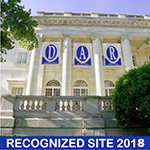 Visit the DAR website at www.dar.org/national-society/scholarships/general-info for more information.